(1). The maximum energy can be output just by dropping 12.5% of the flywheel speed and the forming speed can be keep stably at 0.5m/s or so. (2). Using the VFD, the deforming speed can be adjustable between 0.25m/s to 0.6m/s, which is suitable for alloy forgings. (3). Using hydraulic clutch control can realize the heavy and light striking and continuous striking, and the striking energy can be loaded at any point of the stroke. (4). High deforming energy, twice compared with other screw presses with the same specification. (5). Using duplex guides of cylindrical guide and the X shape guide, assure eccentric load and suitable for multi-station forging process. (6). Long slider stroke without fixed bottom dead point, it is convenient to adjust dies, which will improve the product efficiency and the die lifetime. (7). Using hydraulic cylinder for return stroke, the flywheel does not need to revolve reversely, so the flywheel energy loss and installed power are small. It is energy-efficient. (8). 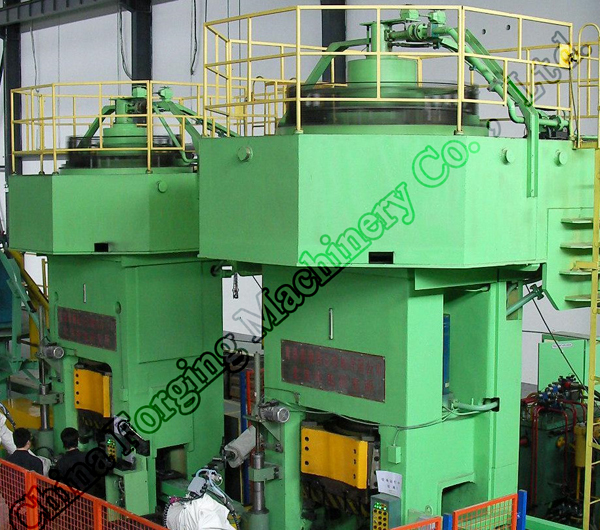 Striking energy, striking stroke, multi-station forging can be preset by PLC. And it can display fault information automatically. (9). It is suitable for continuous product lines for moderate and mass production, and can realize high precision, high efficiency, energy saving and material saving.